Welcome to Board Watch for WCCUSD’s November 2nd Meeting! At the November 2nd Board of Education meeting, our school board members heard a presentation from one of WCCUSD’s Gold Ribbon award winners, Kensington Elementary. The Board also held a public hearing on Richmond College Prep’s proposed Charter revision. Finally, the Board reviewed progress on the Local Control Accountability Plan (LCAP) and discussed various forensic audit recommendations. To explore the full meeting agenda, click here. This past year, 14 WCCUSD schools were honored with the Gold Ribbon award, and Superintendent Matt Duffy “hopes to hear from many of them this year.” Principal Judy Sanders and staff member Ann Forester were invited to share what they’ve done to improve academics and school culture at Kensington. 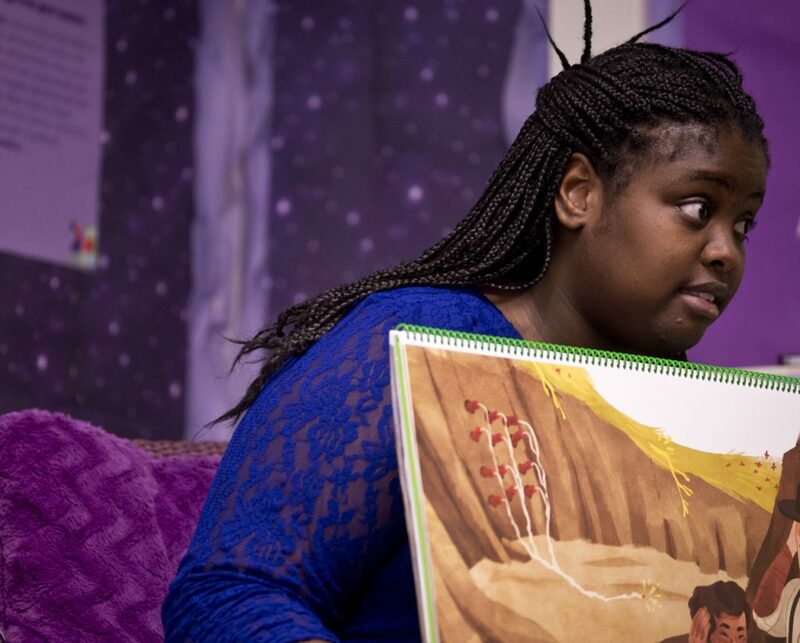 Kensington uses a Collaborative Intervention Model that focuses on students who do not meet or exceed standards in ELA or Mathematics. 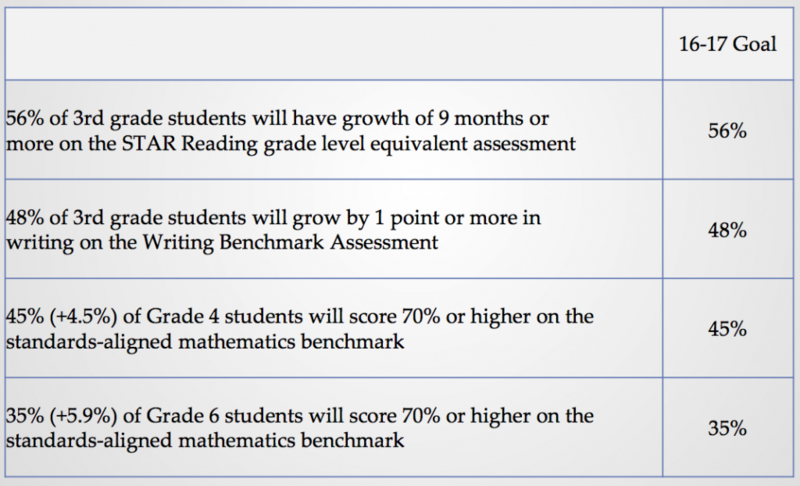 To inform their intervention, on-site teams collaborate to review data from various assessments, including STAR Reading, BPST, SBAC, CELDT, district benchmarks, and other program-embedded assessments. Review Kensington’s Gold Ribbon presentation here. The Board held a public hearing on a charter material revision that would expand Richmond College Prep’s (RCP) program by two grade levels: seventh and eighth grades, with 60 students per grade level. The petition explains that the school will grow by one grade level for the next two years, reaching capacity in the 2018-2019 school year. The team further backed their revision request by highlighting that RCP received both the Innovate Public Schools’ award (14-15 & 15-16) and California Department of Education’s Title I Academic Achievement Award (14-15). 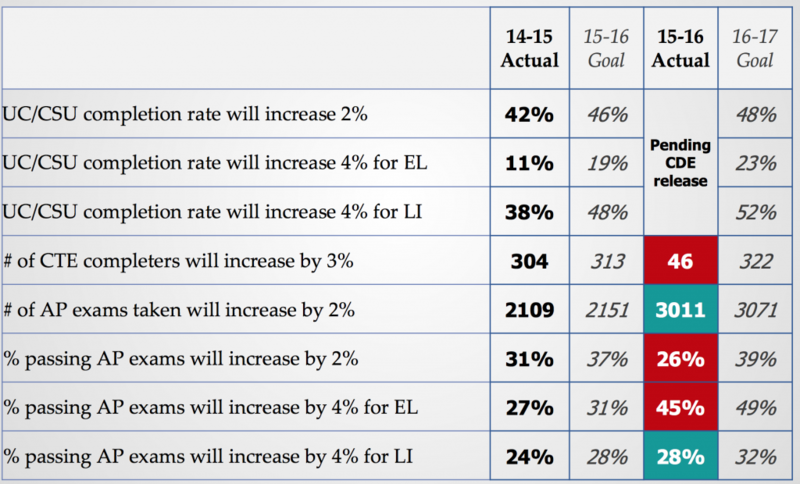 They followed this up by sharing data regarding academic growth at RCP. After the presentation, board member Todd Groves asked if RCP was “prepared for all the needs of a middle school?” Ms. Liano replied, “We’re ready, believe me. That is why we waited four years.” Board member Madeline Kronenberg concluded the conversation by offering that “the real conversation is happening at the next board meeting.” At the next board meeting, our board will vote whether to approve RCP’s petition. Review Richmond College Prep’s presentation here. 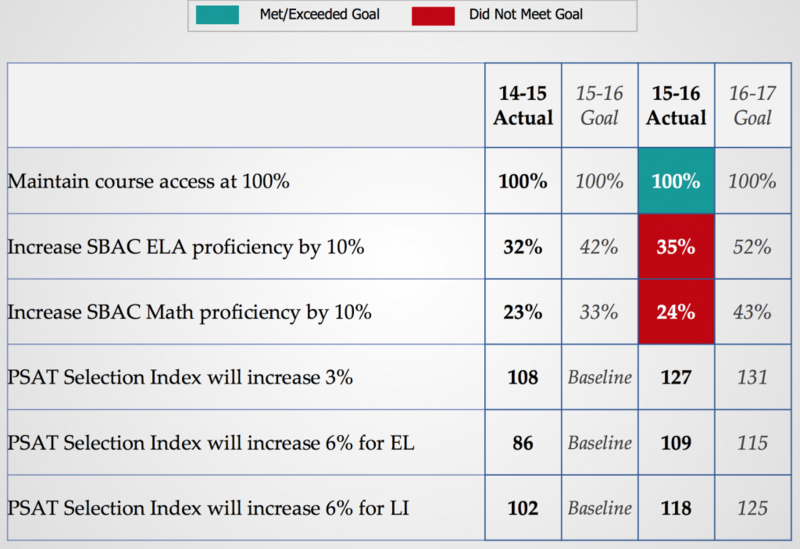 Assistant Superintendent Nia Rashidchi explained, “We have 5 goals in the LCAP, but we’re really focused on Goal 1.” Goal 1 of the LCAP is to “improve student achievement for all students and accelerate student learning increases for English Learner and low-income students” (2016-17 LCAP). *UC/CSU completion refers to the rate of students who graduate having completed the coursework necessary to be eligible to apply to our state universities. Throughout this extensive presentation, our school board members invited several school leaders to share details about actions and results at school sites. Leadership included representatives from Helms Middle, DeAnza High, Stege Elementary, and Dover Elementary. Many expressed gratitude to the Board for their support and funding of the many initiatives previously outlined. 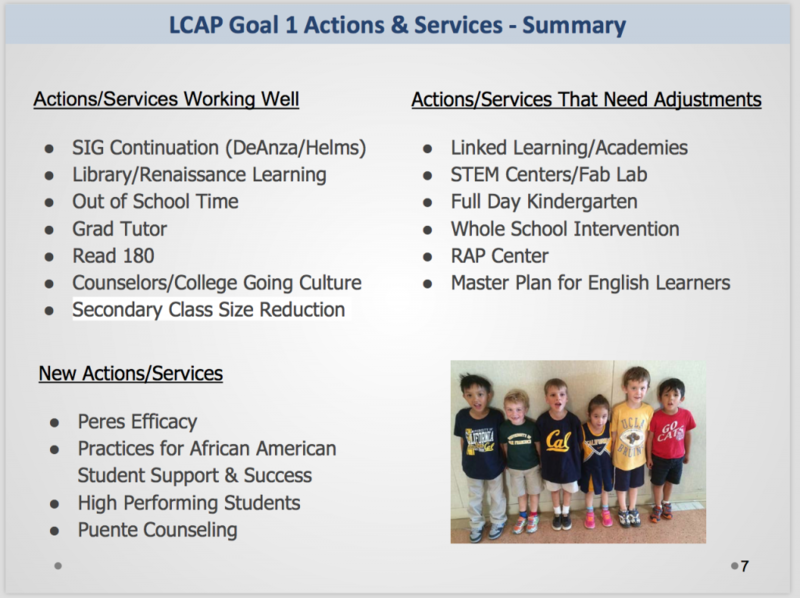 The Board will review LCAP Goal 2 & 3 items at the January 18th Board meeting. 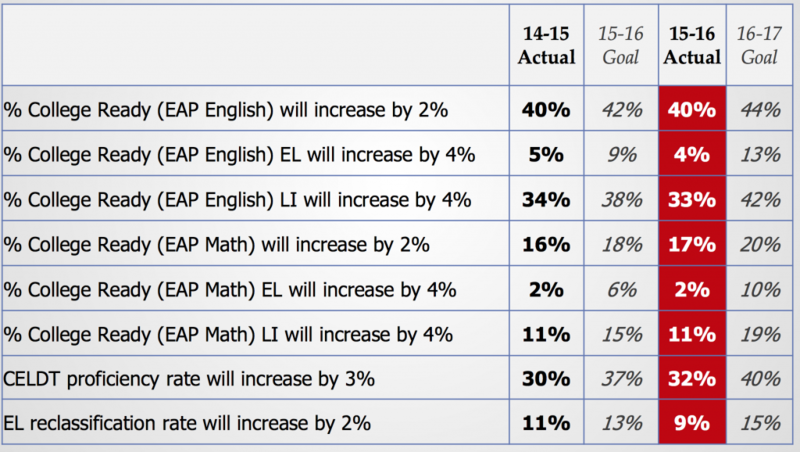 Click here to review the LCAP Goal 1 Progress Update presentation. As result of a recent forensic audit performed on the district’s school construction bond program, legal counsel Harold Freiman presented revisions to the Governance Handbook to our board members. Mr. Freiman’s revisions centered around conflict of interest and the need to use clarifying/concrete language in the Handbook. Many Board members looked for more clarity on the revision process. The Board approved the revisions to the Governance Handbook. The Board voted to push back approval of items G.5 and G.6 (Internal Auditor Job Descriptions) to a later meeting due to time restraints. Click here to view the proposed revisions to the Governance Handbook.